Sangan means Three Eyes (三眼 sangan) in Japanese. This was part of a trend in the beginning of the card game to give cards that had English names in the OCG (Critter), Japanese names in the TCG (Sangan). This is reflected by both being Fusion Materials for Sanwitch. A chibi-version of this monster appears in the artwork of Sanwitch. This monster appears in the artworks of Level Retuner, Tour Bus From the Underworld, Tour Bus To Forbidden Realms, Mistake, Shared Ride, Mistaken Arrest, and Mistaken Accusation. The last five are part of the lore of Sangan. - Master Guide 4 - Monster Stories While making a tour trip to his homeland, the Underworld, Sangan ended up on a wrong bus, being picked on by the monsters from Tribe-Infecting Virus. After fleeing from the bus, Sangan shared a taxi ride with the angel from Graceful Charity. Unbeknownst to him, the driver, an imp from Delinquent Duo, was illegally transporting a Pot of Greed, and when stopped at a checkpoint, he and the Angel were arrested as accomplices. When last seen, he was in a holding cell with Witch of the Black Forest as Sangan sobs while clinging to the bars (apparently saying something to a guard). Double Tool C&D: A monster equipped with “Double Tool C&D” only negates a monster’s effect during your turn while the 2 monsters are battling. This means that it only negates effects that activate on the field, or are continuous effects while on the field. Effects that activate in the Graveyard like “Sangan” are not negated. Greed Quasar: This card cannot be searched from the Deck by cards like “Sangan” that search based on ATK/DEF. Koa'ki Meiru Powerhand: "Koa'ki Meiru Powerhand" only negates a monster's effect while they are battling. That means that it only negates effects that activate only on the field, or are continuous effects while on the field. Effects that activate in the Graveyard like "Sangan" are not negated. Majestic Star Dragon: If you negate "Sangan" with "Majestic Star Dragon" you cannot activate its effect if "Majestic Star Dragon" is sent to the Graveyard. Majestic Star Dragon: If you negate "Sangan" with "Majestic Star Dragon" then attack it, the effect of "Sangan" will activate and resolve normally. Ojama Country: If "Curse of Anubis" is activated while the effect of "Ojama Country" is already in effect, the switched original DEF (which used to be its original ATK) will be 0. If "Ojama Country” is activated while "Curse of Anubis" is already in effect, the 0 original DEF (from the effect of "Curse of Anubis") will be its original ATK, so the ATK will be 0. If “Ojama Country” is already active, and “Curse of Anubis” is activated, “Sangan” would have ATK 600 / DEF 0. While "Curse of Anubis" is already active, and "Ojama Country" is activated. Sangan would have ATK 0 / DEF 1000. Pestilence: The effects of Field Spell Cards and Continuous Spells and Continuous Monster Effects will still be applied while "Pestilence" is equipped. A "Sangan" equipped with "Pestilence" while "Solidarity" and "Mystic Plasma Zone" are active will have 0 + 800 + 500 = 1300 ATK. Reptilianne Viper: If you Summon a monster like "Exiled Force" that has an effect that activates on the field and then activate its effect, it will still be negated. If you Summon a monster like "Sangan" with an effect that activates in the Graveyard, it will not be negated. Revived King Ha Des: If "Revived King Ha Des" or another Zombie-Type monster you control destroys "Sangan" by battle, when their effects are activated they will be negated. The card that is added to the hand is confirmed by the opponent. "Sangan" cannot add "The Wicked Avatar" to your hand, since "?" is not a definite number. : Can "Sangan" add monsters to your hand with indefinte ATK, like "The Wicked Avatar"? When "Sangan" is Tributed to Tribute Summon "Mobius the Frost Monarch" while "Doomcaliber Knight" is on the field, "Sangan" is Chain Link 1 (because it is mandatory) and "Mobius the Frost Monarch" is Chain Link 2 (because it is optional). The effect of "Doomcaliber Knight" will then activate as Chain Link 3. When resolving the effect, "Doomcaliber Knight" will negate the effect of "Mobius the Frost Monarch", and then "Sangan" will resolve normally. : When "Sangan" is Tributed to Tribute Summon "Mobius the Frost Monarch" while "Doomcaliber Knight" is on the field, how do you resolve it? Ally of Justice Nullfier: If "Ally of Justice Nullfier" battles with "Sangan" while "DNA Transplant" is turning "Sangan" into a LIGHT monster, and later "Sangan" is destroyed by "Fissure", then "Sangan"s effect will be negated. : When "Sangan" is a LIGHT monster and battles with "Ally of Justice Nullfier", when it is sent to the Graveyard by another card effect, is the effect negated? Armed Sea Hunter: If "Armed Sea Hunter" destroys a monster like "Mystic Tomato" or "Sangan" by battle, then the monster's effect will be negated even though it activates in the Graveyard. : Will the effect of a monster which activates in the Graveyard or in the place to where the monster is removed from play be negated by "Armed Sea Hunter"? Lightning Warrior: The damage inflicted by the effect of "Lightning Warrior" is based on the number of cards in your opponent's hand when the effect resolves. : The effect of "Lightning Warrior" inflicts damage to your opponent's Life Points based on your opponent's hand size at what time? Example: Your opponent has two cards in his hand, and your "Lightning Warrior" attacks your opponent's "Sangan". The effect of "Lightning Warrior" activates as Chain Link 1, and the effect of "Sangan" activates as Chain Link 2. Resolving backwards, the effect of "Sangan" adds a card to your opponent's hand, and afterwards the effect of "Lightning Warrior" resolves. At this time, your opponent has three cards in his hand, so your opponent takes 900 damage. Thunder King Rai-Oh: When "Sangan" is sent to the Graveyard while "Thunder King Rai-Oh" is face-up on the field, "Sangan"s effect activates normally and starts a chain. However, the effect of "Sangan" resolves without effect. : What happens when the effect of "Sangan" activates when "Thunder King Rai-Oh" is face-up on the field? Blackwing - Gale the Whirlwind: If "Blackwing - Gale the Whirlwind" targets a "Sangan" affected by "Rush Recklessly" (1700 ATK), its ATK will become 850. During the End Phase, when "Rush Recklessly" is no longer applied, the ATK of "Sangan" will remain at 850.: When a monster is affected by "Rush Recklessly" and then "Blackwing - Gale the Whirlwind", what does its ATK become during the next turn? Blackwing - Gale the Whirlwind: If "Rush Recklessly" targets a "Sangan" affected by "Blackwing - Gale the Whirlwind" (500 ATK), the ATK of "Sangan" will be 1200.: When a monster is affected by "Blackwing - Gale the Whirlwind", can the monster's ATK/DEF change with other effects? Blackwing - Gale the Whirlwind: If a "Sangan" which has been affected by "Blackwing - Gale the Whirlwind" (500 ATK) is affected a second time, it will have 250 ATK. Blackwing - Gale the Whirlwind: If "Blackwing - Gale the Whirlwind" targets a "Sangan" equipped with "Black Pendant" (1500 ATK), it will have 750 ATK. When "Black Pendant" is removed from the field, "Sangan" will still have 750 ATK. : When a monster has its ATK/DEF halved by "Blackwing - Gale the Whirlwind" while it is equipped with a card, what does its ATK become when the equipped card is destroyed? Elemental HERO Great Tornado: Suppose "Sangan" which is equipped with "Black Pendant" (1500 ATK) has its ATK is halved by the effect of "Elemental HERO Great Tornado" (to 750). If "Black Pendant" is removed from the field, then the ATK of "Sangan" remains at 750.: After the effect of "Elemental HERO Great Tornado" is applied, what does the ATK become if an Equip Card is destroyed? Infernity Doom Dragon: The damage inflicted by the effect of "Infernity Doom Dragon" is equal to half the ATK of the destroyed monster while it is on the field. : For the damage-inflicting effect of "Infernity Doom Dragon", the damage inflicted uses the ATK of the destroyed monster at what time? Example: If "Infernity Doom Dragon" destroys a "Sangan" equipped with "Axe of Despair" (2000 ATK), then you inflict 1000 damage to your opponent. Obelisk the Tormentor: If you activate "Ultimate Offering" to Tribute Summon "Obelisk the Tormentor" and the opponent Chains "Raigeki Break" to destroy "Sangan", then "Sangan" is destroyed at Chain Link 2 and "Obelisk the Tormentor" is Tribute Summoned at Chain Link 1. Normally, the effect of "Sangan" will begin a new Chain after the current one resolves. However, when you finish resolving the Chain, the last thing to resolve is the Tribute Summon of "Obelisk the Tormentor", so the effect of "Obelisk the Tormentor" is applied and the effect of "Sangan" does not activate. : Does the effect of "Sangan" activate if it was destroyed when resolving Chain Link 2 and "Obelisk the Tormentor" was Summoned at Chain Link 1? Obelisk the Tormentor: If "Sangan" is Tributed for a Tribute Summon, then its effect activates "When the monster is successfully Tribute Summoned". However, the effects of Spell Cards, Trap Cards, and Effect Monsters do not activate when "Obelisk the Tormentor" or "The Winged Dragon of Ra" is successfully Tribute Summoned, so the effect of "Sangan" does not activate. : When "Obelisk the Tormentor" is Normal Summoned and "Sangan" is Tributed and sent from the field to the Graveyard, will the effect of "Sangan" be activated? Obelisk the Tormentor: When "Obelisk the Tormentor" is Summoned by "Ultimate Offering" by Tributing "Sangan",: When "Obelisk the Tormentor" is Normal Summoned by "Ultimate Offering" in the middle of a Chain, will the effect of a Tributed "Sangan" activate? If "Ultimate Offering" is Chain Link 1, then when the Chain finishes resolving, the last thing to resolve is the Normal Summon of "Obelisk the Tormentor". Thus, the effect of "Sangan" will not activate. If "Ultimate Offering" is Chain Link 2, then when the Chain finishes resolving, the last thing to resolve is not the Normal Summon of "Obelisk the Tormentor". Thus, the effect of "Obelisk the Tormentor" is not applied, so the effect of "Sangan" will activate. Possessed Dark Soul: If "Possessed Dark Soul" has you gain control of a Level 3 or lower monster, then you still retain control of the monster even if the monster's Level is increased to 4 or higher. : After you gain control of a monster because of the effect of "Possessed Dark Soul", does control of it reset if its Level becomes 3 or higher? Example: If "Possessed Dark Soul" has you gain control of "Sangan" (Level 3), then "Sangan" is not returned to the opponent's control if its Level is increased to 4 because it is equipped with "Synchro Boost". Tempest Magician: The effect of "Tempest Magician" can only place Spell Counters on cards that can hold Spell Counters. You cannot place Spell Counters on a monster like "Sangan" which cannot hold Spell Counters. : Can the effect of "Tempest Magician" place Spell Counters on cards like "Sangan"? The Tyrant Neptune: The ATK of "The Tyrant Neptune" is increased by the total ATK(s) of the Tributed monster(s); the DEF of "The Tyrant Neptune" is increased by the total DEF(s) of the Tributed monster(s). You do not increase the ATK by the combined ATK and DEF. : Does the ATK of "The Tyrant Neptune" increase by the total ATK and DEF? Alector, Sovereign of Birds: The effect of "Alector, Sovereign of Birds" will only negate effects that activate on the field, or that are applied as long as the monster remains on the field. It will not stop effects like those of "Sangan" or "Black Pendant" that activate when sent to the Graveyard. : Can the effect of "Alector, Sovereign of Birds" negate an effect that does not activate on the field, or an effect if the card is not on the field at resolution? Debris Dragon: When "Debris Dragon"/"Black Salvo"/"Doomkaiser Dragon/Assault Mode"/etc Special Summon a monster with an effect that activates in the Graveyard like "Sangan"/"Giant Rat"/"Mystic Tomato"/etc, then that effect is not negated. This is because "Debris Dragon"/etc only negate effects which activate or are applied on the field. : When "Sangan" etc is Special Summoned by the effect of "Debris Dragon" etc, is its effect which activates in the Graveyard negated? Double Tool C&D: The effect of "Double Tool C&D" will only negate effects which activate on the field, or Continuous Effects which are applied for as long as the monster remains on the field. It cannot negate effects which activate in the Graveyard, like the effect of "Sangan". If "Winged Kuriboh LV10"/"Cyber Valley"/etc is attacked, then its effect can be activated, but the effect is negated because it was activated on the field. : Can the effect of "Double Tool C&D" negate an effect if the monster is not face-up on the field? Forbidden Chalice: The effect of "Forbidden Chalice" will only negate effects which activate on the field, or Continuous Effects which are applied for as long as the monster remains on the field. It cannot negate effects which activate in the Graveyard, like the effect of "Sangan". : Can the effect of "Forbidden Chalice" negate the effect of a monster which is not on the field? Hundred Eyes Dragon: If "Hundred Eyes Dragon" gains a monster's effect(s), then it has the monster's effect(s) as long as it remains face-up on the field. If "Hundred Eyes Dragon" leaves the field, then it no longer has the monster's effect(s). Thus, if "Hundred Eyes Dragon" gains the effect of "Sangan" or "D.D. Scout Plane", then you cannot activate the gained effects. : If "Hundred Eyes Dragon" gains an effect which activates in the Graveyard or in the place to where cards are removed from play, then can the effect be activated? Koa'ki Meiru Powerhand: The effect of "Koa'ki Meiru Powerhand" will only negate effects which activate on the field, or Continuous Effects which are applied for as long as the monster remains on the field. It cannot negate effects which activate in the Graveyard, like the effect of "Sangan". : Please explain the effect of "Koa'ki Meiru Powerhand" which negates the effects of LIGHT and DARK monsters. Majestic Star Dragon: A monster whose effects are negated by "Majestic Star Dragon" only has its effects negated while the monster is face-up on the field. If "Majestic Star Dragon" negates the effects of a monster like "Sangan", then when "Sangan" is sent to the Graveyard its effect of adding a card from the Deck to the hand is not negated. : If "Sangan" is negated by "Majestic Star Dragon" and sent to the Graveyard, then is its effect negated? Majestic Star Dragon: "Majestic Star Dragon" can only activate the effect of an opponent's monster as its own effect if "Majestic Star Dragon" is face-up on the field. Thus, if "Majestic Star Dragon" negates the effects of a monster like "Sangan" whose effect activates in the Graveyard, then when "Majestic Star Dragon" is sent to the Graveyard you may not activate the effect of "Sangan" as the effect of "Majestic Star Dragon". : When a "Majestic Star Dragon" who is negating the effect of "Sangan" is sent to the Graveyard, can you add a card from your Deck to your hand? Mosaic Manticore: "Mosaic Manticore" will only negate effects which activate on the field. It will not negate the Graveyard effects of "Sangan", "Mystic Tomato", "Giant Rat", etc. : When "Sangan" is Special Summoned by "Mosaic Manticore", is its effect which activates in the Graveyard negated? Neo-Spacian Dark Panther: The effects of "Neo-Spacian Dark Panther" or "Phantom of Chaos" are only applied as long as "Phantom of Chaos" or "Neo-Spacian Dark Panther" are face-up on the field. When the monster is removed from the field, then it no longer has the copied effects. If a monster like "Neo-Spacian Dark Panther" copies "Sangan" or "D.D. Scout Plane", then you cannot activate the effect of "Sangan" which activates in the Graveyard or the effect of "D.D. Scout Plane" which activates in the place to where cards are removed from play. : If "Phantom of Chaos" obtains an effect which activates in the Graveyard or the place to where cards are removed from play, then can the effect be activated? Phantom of Chaos: "See above; listed under "Neo-Spacian Dark Panther"." Skill Drain: The effect of "Skill Drain" only negates the effects of face-up monsters. Thus, effects that activate in the Graveyard - like the effects of "Sangan" or "Pyramid Turtle" - are not negated by "Skill Drain". : While "Skill Drain" is active, can you negate the effects of monsters like "Sangan" which activate in the Graveyard? The Fabled Unicore: The effect of "The Fabled Unicore" will also negate the effect of "Sangan" which activates in the Graveyard, the effect of "D.D. Survivor" which activates in the place to where cards are removed from play, and the effect of "Serpentine Princess" which activates in the Deck. However, "Sangan", "D.D. Survivor", and "Serpentine Princess: Can the effect of "The Fabled Unicore" negate the effect of a card which activates in a place other than on the field? If you control your opponent's "Sangan" and it is destroyed, your opponent gets the effect since it activates in his/her Graveyard. You can chain to "Sangan's" effect. Angel O7: If you Tribute "Sangan" when you Tribute Summon "Angel O7", "Sangan's" effect does not activate. Banisher of the Light: Effects that trigger when cards are sent to the Graveyard, such as "Sangan" will not activate. Bubble Crash: If "Sangan" is sent to the Graveyard, their effects do activate. Cyber Jar: If "Sangan" was destroyed by "Cyber Jar's" effect, Special Summon monsters first and then complete "Sangan's" effect. Ground Collapse: When resolving the effect of "Cyber Jar" or "Morphing Jar #2", if you pick up more monsters than you can Special Summon, due to "Ground Collapse", the monsters you cannot Special Summon are destroyed. If a "Sangan" or "Witch of the Black Forest" is destroyed this way, its effect does not activate. 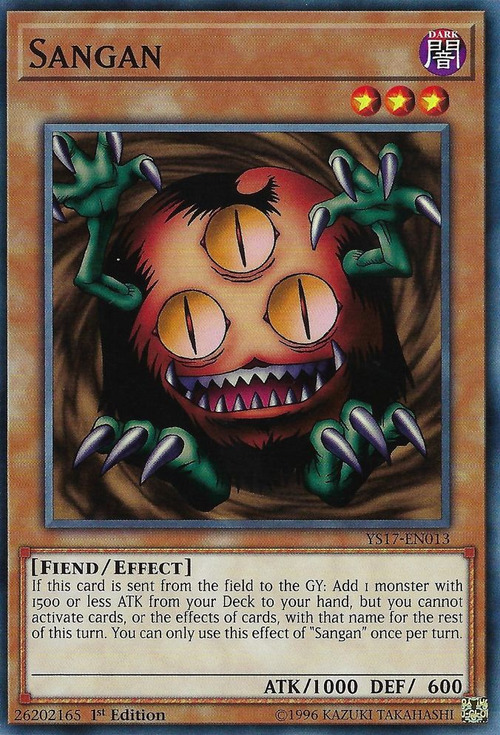 Lesser Fiend: Monsters destroyed by this card as a result of battle are not sent to the Graveyard, so "Sangan"would not have their effects activated, and the effect of "Kycoo the Ghost Destroyer" will not prevent them from being removed from play. Sasuke Samurai: If "Sasuke Samurai" destroys a face-down monster using its effect, the face-down monster is NOT "destroyed as a result of battle", it is destroyed by "Sasuke Samurai's" effect However, monsters like "Sangan" will still activate their effects. You must show your opponent the monster you select from your Deck for this card's effect. If you have no eligible monsters, your opponent gets to see your Deck to verify. Deck Lockdown: If "Sangan" is sent from the field to the Graveyard while "Deck Lockdown" is active, its effect will start a Chain but its effect will disappear when it resolves. Maju Garzett: You can't search for "Maju Garzett" with "Sangan"
Thunder King Rai-Oh: Cards with mandatory Trigger Effects that would add cards from the Deck to the hand still activate, but their effects are negated. For example, if "Sangan" is destroyed and sent to the Graveyard while "Thunder King Rai-Oh" if face-up on the field, "Sangan's" effect activates and starts a Chain, but the effect is negated when it would resolve. 7: If other cards are also sent to the Graveyard at the same time, like "Sangan" , the card controlled by the turn player is Step 1. Armed Changer: If the monster equipped with this card destroys a monster like "Sangan" its effect will form a chain with them according to the rules of simultaneous effects (see Advanced Gameplay FAQ). Doomcaliber Knight: When multiple Effect Monster effects activate simultaneously, "Doomcaliber Knight's" effect is chained after determining the order of the Effect Monster effects (see the Advanced Rulings FAQ "Simultaneous Effects") and will negate the Effect Monster's effect that was placed last on the Chain. Example 1: Player A Tributes her "Sangan" and "Witch of the Black Forest" to Tribute Summon "Dark Magician". "Sangan's" effect is Chain Link 1 and "Witch of the Black Forest's" effect is Chain Link 2. The effect of Player B's "Doomcaliber Knight" is chained, and it will negate "Witch of the Black Forest's" effect. Example 4: If "Sangan" is Tributed to Tribute Summon "Raiza the Storm Monarch" while "Doomcaliber Knight" is face-up on the field, "Sangan's" effect is Chain Link 1 and "Raiza the Storm Monarch's" effect is Chain Link 2. "Doomcaliber Knight's" effect is chained, negating "Raiza the Storm Monarch's" effect and destroying it. Horn of Light: If a "Sangan"equipped with "Horn of Light" is Tributed and you activate the effect of "Horn of Light", "Horn of Light" goes on top of your Deck and then "Sangan" is resolved. If "Sangan" is destroyed (not Tributed) the effects of "Sangan" and "Horn of Light" are simultaneous and form a chain. Malevolent Nuzzler: If a "Sangan"equipped with "Malevolent Nuzzler" is Tributed and you activate the effect of "Malevolent Nuzzler", "Malevolent Nuzzler" goes on top of your Deck and then "Sangan"is resolved. If "Sangan" is destroyed (not Tributed) the effects of "Sangan" and "Malevolent Nuzzler" are simultaneous and form a chain. Cyber Blader: When the opponent has exactly 3 monsters, "Cyber Blader's" effect only negates the effects of Spell, Trap, and Effect Monster Cards that activate or are active on the field. It will not negate the effect of "Sangan"
Dark Lucius LV6: If "Dark Lucius LV6" destroys "Sangan" while "Macro Cosmos" or "Grave Protector" is active, the effect of "Sangan" cannot activate, so it is not negated. So you cannot Special Summon "Dark Lucius LV8". Dark Ruler Ha Des: Flip Effects and effects that activate in the Graveyard WILL be negated. This includes "Sangan"
Dark Ruler Ha Des: If your Fiend-Type monster battles with "Relinquished" equipped with a "Sangan" and the equipped card is destroyed instead of "Relinquished", the effect of "Sangan", etc., will activate since it was the effect of "Relinquished" that destroyed it. It was not destroyed as a result of battle with the Fiend-Type monster. Diffusion Wave-Motion: A Level 7 Spellcaster-Type monster selected with "Diffusion Wave-Motion" will negate: the Flip Effects of a monster it destroys as a result of battle, or the effects of"Sangan"
Divine Wrath: You can activate "Divine Wrath" to negate an effect that activates in the Graveyard, such as "Sangan". Gorgon's Eye: "Gorgon's Eye" cannot negate the effect of "Sangan"because they activate in the Graveyard. If a Defense Position "Slate Warrior" is attacked and destroyed, the effect of "Slate Warrior" that lowers ATK and DEF is applied because it activates in the Graveyard. Light and Darkness Dragon: If you Tribute “Sangan” and “Witch of the Black Forest” to Tribute Summon “Light and Darkness Dragon”, the effect of “Sangan” and “Witch of the Black Forest” form a Chain. “Light and Darkness Dragon” will negate the activation of whichever effect is placed second on the Chain. Mystical Knight of Jackal: "Mystical Knight of Jackal" sends a monster to the Graveyard as a result of battle, and THEN returns it to the top of the deck, so "Sangan"will activate their effects. Necrovalley: "Necrovalley" will NOT negate effects that are activated when a card is sent TO the Graveyard or that activate IN the Graveyard or that count cards in the Graveyard. So it will NOT negate the effects of "Sangan"
Neo-Spacian Dark Panther: "Neo-Spacian Dark Panther's" effect is only applied while it is face-up on the field. So if you target "Sangan" and then this card is sent to the Graveyard nothing will happen, because in the Graveyard it no longer copies "Sangan's" effect. Nobleman of Crossout: The targeted monster, and any cards of the same name if the target was a Flip Effect Monster, are removed from play and never go to the Graveyard, so the effects of cards like "Sangan" will not activate. Prohibition: If "Prohibition" declares "Sangan" , if the declared card is on the field when "Prohibition" resolves, its effect will activate when it is sent to the Graveyard. If the declared card is Special Summoned after "Prohibition" resolves, it "cannot be used", so its effect will not activate when it is sent to the Graveyard. Skill Drain: "Skill Drain" negates the effects of face-up Effect Monsters on the field, but does not negate effects that activate in the Graveyard, such as"Sangan"
Time Machine: If a monster with an effect that activates when it is destroyed by battle is sent to the Graveyard, like "Sangan" or "Giant Rat", you can chain "Time Machine". Banisher of the Radiance: If "Banisher of the Radiance" and "Sangan" are destroyed simultaneously by an effect like "Lightning Vortex", then both are sent to the Graveyard and "Sangan's" effect activates normally. : Banisher of the Radiance and Sangan - simultaneous destruction! Last Turn: If the turn player Special Summons "Sangan" for "Last Turn", and "Sangan" is destroyed during the special Battle Phase, then its effect is resolved. If the turn player hasn't Normal Summoned a monster that turn, they can Summon the monster retrieved with "Sangan" during their Main Phase (and attack during their standard Battle Phase). This can result in a DRAW. Twin-Shield Defender: "Twin-Shield Defender" halves the current ATK of the targeted monster, including any gains and/or losses from effects. Example 1: "Sangan" equipped with "Axe of Despair" has 2000 ATK. If its ATK is halved by "Twin-Shield Defender" it will have 1000 ATK. Example 2: "Sangan's" original ATK is halved by "Shrink" to 500 ATK. If its ATK is halved by "Twin-Shield Defender", it will have 250 ATK. Twin-Shield Defender: If "Shrink" or "Megamorph" is activated after "Twin-Shield Defender's" effect resolves, "Twin-Shield Defender's" effect disappears. Example 1: If "Sangan's" ATK is halved by "Twin-Shield Defender" to 500 ATK and afterwards its original ATK is halved by "Shrink", it will have 500 ATK. Example 2: If "Sangan's" ATK is halved by "Twin-Shield Defender" to 500 ATK and afterwards it is equipped with "Megamorph", it will have 500 ATK or 2000 ATK (depending on Life Points). Dark Magician of Chaos: When you Tribute Summon "Dark Magician of Chaos" with "Sangan"those cards effects are Step 1 of the chain, and "Dark Magician of Chaos" effect is Step 2.The latest print of "Dark Magician of Chaos" uses Problem-Solving Card Text, which makes it clear that its effect activates during the End Phase of the turn it was Normal or Special Summoned, not when it is Summoned. This also means that its effect cannot be part of Simultaneous Effects Go On Chain. This difference is due to a major change in the functionality of "Dark Magician of Chaos".